If you are young, a teenager,a student and you are looking for an affordable smartphone, a very good suggestion would be Sony Ericsson Xperia Ray. The number one factor is the price, the terminal price being around 300 $, so very reasonable, especially compared to other handsets Xperia. The quality remains the same! A bit of gaming from Xperia Play, a bit of Xperia Arc photo camera and plenty of socializing and multimedia, this gives for us the newcomer. Sony Ericsson Xperia Ray looks and moves well and is perfect for replacement of MP3 player and camera in the pocket of a young man. Somehow this reminds me of the LG model Black Optimus, only less wide and a newer Android and fresher interface. 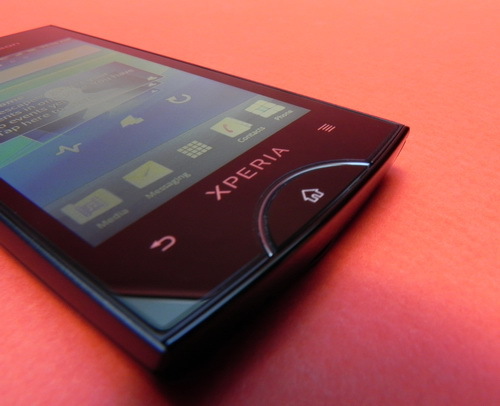 Xperia Ray measures only 9.4 mm in thickness and it weighs only 100 grams, so it is a slim and light phone that fits in any pocket. Its LCD screen is a 3.3 inch touchscreen with 480 x 854 pixels and high quality images, thanks to Bravia Mobile Engine, which provides outstanding color and clarity. The terminal comes with 1 GB internal memory, 512 MB RAM and a 4GB card package. Unfortunately the 512 MB RAM with the 1GHz Scorpion CPU will feel while running Gingerbread sometimes, especially when you use plenty of live widgets, which have serious load playlists, hundreds of contacts and hundreds of tweets and Faceboo statuses. If however you are more organized with customizable interface, you will not have any problems. Nothing surprising in Chapter connectivity: HSDPA up to 7.2Mbps, WiFi 802.11 b / g / n, DLNA, Bluetooth 2.1 with A2DP and microUSB 2.0. The phone also comes with a stereo FM radio, A-GPS and a Li-Ion 1500 mAh, which is not doing too well when it is required in full. Therefore, several hours of viewing movies and download the games will exhaust the battery during the day. Among the strengths of this phone is the video playback, which looks great. On the photo capture chapter this phones does not stay bad because it is equipped with an 8-megapixel camera with autofocus, LED flash, geotagging, face detection, touch focus and image stabilizer. In terms of video capture, the 8 MP camera is capable of recording 720p HD, which looks good, but not up at the height of the Sony Ericsson Xperia Arc. One more thing to appreciate on this phone is the bright semicircle which is at the bottom.It turns into white when you will use the phone, green and red when it is loaded or the battery is running out. The jack and microUSB port are not doing a good impression, destroying the phone appearance, especially when connected to PC.